What do our clients think? Average 5 out of 5 based on 26 reviews. 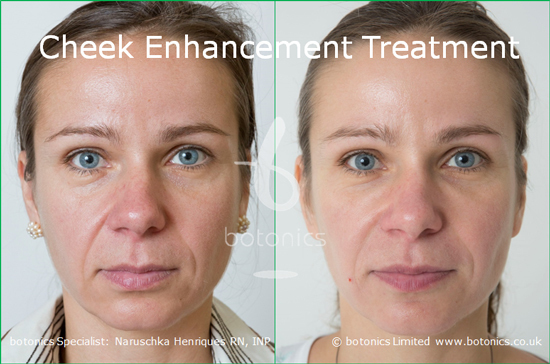 Cheek enhancement treatment is available in the UK from botonics at our prestigous Harley Street clinic, in the heart of London’s private medical district. A cheek enhancement is an advanced treatment, and needs to be done by an experienced specialist to reduce the risk of asymmetry and to produce an aesthetically beautiful outcome. At botonics, we have developed techniques that produce an instant, graceful, refined and elegant result with minimal discomfort and risks. At your free consultation, the specialist will review your detailed medical history and advise whether a Cheek enhancement treatment is appropriate for you. Most people are keen to have their treatment as soon as possible. We are usually able to do the treatment on the same day as your consultation if you wish to proceed, but there is never any obligation to do so. Your specialist will then apply a fast acting topical anaesthetic, and then wait for it to take full effect (about 30 minutes). We find that Restylane Sub-Q is usually best and lasts the longest for Cheek enhancement. In addition to the topical anaesthetic, we also normally use a dermal filler than contains an anaesthetic which further reduces discomfort (though it can result in more swelling than non-anaesthetic fillers). The injections only take about 15 – 20 minutes. This has two immediate affects. First, it restores the buccal fat pad over the cheek, giving you the cheek bones of your youth (or better!). Second, the lifting affect of the cheeks subtley reduces the jowling along the jaw line. Overall, the slight changes can have a dramatic anti-ageing affect! One of the great things about a cheek enhancement is that the results are instant. You’ll probably have some slight redness on the day, which will go away in a day or two. But if you’ve got a big event coming up, it’s a great way to take years off quickly. Don’t worry, we’ll make sure you look completely natural after your subtle cheek enhancement. You’ll look like you, just younger! Cheek enhancements tend to last longer than treatments to other areas of the face because there is less movement in the area to break down the product. Depending on your metabolism, a Restylane Sub-Q Cheek enhancement will last 6 – 9 months or longer. The filler is gradually broken down over time and safely eliminated through the body’s natural metabolic processes. To learn more, see our Dermal Filler Frequently Asked Questions. If you want to know what you’ll need to do after your treatment, see our Dermal Filler Aftercare Instructions. We use only brand-name, gold standard fillers as manufactured and approved for use in the UK. Beware of cut-price treatments that use generic fillers from India or China. At botonics, we take a full hour to administer our Dermal filler treatments which means the topical anaesthetic we use has time to take effect. Our prices for Cheek enhancement treatments start from just £750, and you can spread the cost of any treatment over £600 interest free for up to three months. Who is a candidate for a Cheek enhancement? If you’re unhappy with the shape, symmetry or contour of your cheeks, then our Cheek enhancement treatment could be your answer. Click on the Contact us link below to book a free consultation with our Cheek enhancement specialist.